Dan's Adventures in Fiction: Free Books - Still a Hard Sell? 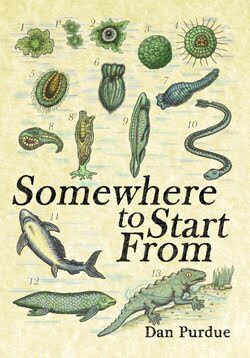 For the whole month of October, I made the electronic version of my collection of short stories, Somewhere to Start From, free. All people needed to do was log in to Smashwords, input the discount code, and download the file to their computer or e-reader. It turned out to be a far from irresistible offer. Here's where I think I went wrong. I didn't expect a huge response, to be honest. The book's been available for a while, and in some ways it's probably close to the end of its shelf-life. However, it's been a remarkably quiet year for me (in terms of publications or competition results), and I'd picked up another couple of hundred followers on Twitter since the last time I did any significant promotional stuff. Plus I still haven't managed to inflict a copy on everyone I know in the real world, so I thought it was worth another go. I didn't take a screenshot of the book's page visits and downloads statistics, so you're spared another graph. Suffice to say things got off to a good start, with plenty of visits spurred on by people retweeting my initial link to this blog. Five copies were downloaded within 24 hours, which seemed like a good start. But from then on it was a case of diminishing interest, with fewer visits each day and the occasional spike when I tweeted about it or put a post on Facebook. Downloads cropped up sporadically, one or two at a time. Overall, I think the number of e-copies I 'sold' was in the low teens, so hardly a runaway success. A month is too long. If you're promoting something, you need to instil a sense of urgency. Your potential customers should feel like the opportunity to grab the glittering treasure on offer is fleeting. That initial spurt of attention might be all the interest you get - so don't give potential customers three or four weeks to think about whether they actually want the book. Because by then something else will have come along and they'll have forgotten all about you. A quid off is not the bargain of the century. The ebook version of STSF has always been priced at 99p (or thereabouts). I've never been sure if this is too cheap or whether it's a sensible price for people who stumble across my work somewhere and might fancy reading more. I'm not trying to make a living from the collection, so my aim was to price it at a level appropriate to the possibility of an impulse buy. Still, I think making an already very cheap thing free was never going to trigger a torrent of downloads - chances are the majority of people who were interested in buying it wouldn't have been put off by having to shell out a pound. Nobody knows who I am anymore. I, or at least my writing, was not particularly visible during 2013. With only a couple of stories (which I'd submitted in 2012) going online in the early part of the year - and only one of those featuring a link to this website - I've not done a great job of bringing my work to the attention of new readers. Success begets success, and with almost nothing new of mine making its way into the world, it's understandable that my offer didn't cause much of a stir. A few more published stories, even a competition shortlisting or two, might have helped ensure people thought my work was worth reading. A few tweets do not a 'campaign' make. There's little more annoying than a Facebook or Twitter account that does nothing but pump out promotional tweets for the owner's latest book. It's a bitter pill to swallow, but only a small proportion of those who bother to read your output on social media are actually going to be interested in reading anything else you've written. I'm possibly over-cautious in this regard, worried about annoying my followers and friends, and the half-dozen mentions I made over the course of the month weren't enough to ensure a good cross-section of my online following saw at least one of the links. I didn't update the blog very often, and I also did nothing at all offline to promote the book, which ought to be an important part of any successful publicity campaign. Everyone else is doing it. Seriously, is there anybody out there who isn't promoting a book? Mine was just another, fairly feeble, voice in a sea of thousands, all shouting more or less the same thing. I didn't give much thought to how I would make my offer stand out from the crowd, I didn't tie it in with any particular event, in short I didn't make it seem unique or relevant - two factors I'm sure would have helped convince people it was worth taking a look. People are lazy and suspicious. This may seem a harsh thing to say, but I think it's true - to some extent, at least. One thing I noticed was that although the entire book was available without charge, people were still downloading the free sample (effectively the same as Amazon's 'Look Inside' feature). I was wondering why this was - if you were interested enough to read the first few pages, why not have the whole thing if it didn't cost you anything? Then I realised - you can get the sample without opening a Smashwords account. This made sense. I don't like joining new sites, so I try to limit it to occasions when it's the only way of getting something I really want. Most people I know have never self-published an ebook, and so have never heard of Smashwords. Were potential readers worried about signing up to an unknown site? Concerned about ending up on a spammy mailing list? Did it all seem too much hassle? I suspect that unfamiliarity played a part - things might have been different if I'd made the book available on Amazon, which most people don't necessarily like but at least know and trust. So, although it was a long way from an unqualified success, it was a worthwhile experiment. Plus, two reviews appeared soon after the end of the promotion (although I think only one was directly linked with the giveaway). A glowing one from Shirley Golden, and a more reserved one from Paul Isaac. As ever, I'm very grateful to both these readers for taking the time to review my book, especially considering -as Paul points out on his blog- how difficult (even nonsensical) it is to attempt to rate a collection of stories when they differ wildly in tone and genre. I always try to look for something positive - whatever the situation. What I take from this exercise is the conclusions you make. You haven't just 'sent' the book out there, you've bothered to analyse the results. One campaign does not a career make - or break. Establishing your name does you no harm. Thanks, Dan - this is a really useful post. I shall come back to it if ever I decide to do something similar! I think "nobody knows who I am" is a big factor. My blog hits and Twitter followers always soar after I have a publication - however small - or even if I just appear on somebody else's blog. This year those occasions were few and far between for me too. I hope everybody knows who you are by this time next year! Thanks for sharing this, Dan. I don't have a book out there yet, other than 2 anthologies I've co-edited - but maybe one day I will. As you say we are all following or trying to follow the same path as so many others, but your wise words will help those who heed them. And may I say a good review from Shirley Golden can't be bad as she is herself a great writer. I loved the story she submitted to the last Greenacre Writers comp. Freebies used to get a much bigger response, I think. Perhaps people's kindles are overloaded with free and so far unread books? Thanks, everyone - I'm glad this is potentially useful information. Thanks for the encouraging words, too! Although it wasn't a runaway success, I still think the giveaway was worthwhile and I'd far rather make my mistakes with this collection than be trying to promote my first published novel (assuming I get there someday!) with no experience of how all this stuff works. Helen - You're right, and in fairness there wasn't a lot riding on this campaign. It was something I decided to do on a whim, and then found I didn't really have the time to get any momentum behind it. There'll be other chances, I'm sure. Chloe - Fame is fleeting! It's so easy to feel like you're really on a roll when you get a couple of good results or publication hits close together, and it seems so unfair when it all seems to dry up for no good reason. Here's to 2014 being more successful for both of us - with luck a publisher will snap up your book long before this time next year! Lindsay - yes, I was very pleased to read Shirley's review. I've read a couple of her stories and you're right - she knows what she's talking about! Cheers for the blog link Dan, much appreciated. I think Patsy's right - our Kindle's are overloaded with free books we haven't got around to reading. I'm as guilty as anyone and consequently have stopped 'grabbing' free books until I get through the backlog. If it's any consolation I struggle with e-book marketing too. Not sure how i missed your comment, Patsy, sorry about that. I suspect you're right, and freebies are not the draw they used to be. Like Sally, i have several unread books on my Kindle app that look good but unless I'm stuck somewhere unexpectedly I'm not sure when I'm likely to read them. I should have been quicker off the mark with my ebook, clearly! And thanks again, Paul. I appreciate that everyone needs to be careful with their cash these days - I just meant that anyone who really wanted the book could probably have found the money, whereas those who were interested or just curious about it, but more budget-conscious, would have held on a bit longer. I'm not convinced anyone who downloaded it did so just because it was free. I think the awareness / interest in the book needs to be there before this kind of offer will make much of an impact.